This tile is the best replacement to conventional asbestos, metal G.I. sheets and PVC sheets considering the heat insulation, sound insulation, water resistance, chemical and alkali resistance, corrosion proof, fire retardant, eco friendly, easy to install and move, light weight as well as cost effective in installation (as less steel and less overlap), as per the efficiency and benefits it provides. It can save construction cost upto 50%. 1)PVC one layer /PVC+ASA two layer/PVC+PVC+ASA Three layer /PVC+PVC+PVC+ASA Four layer .ASA layer for anti-UV for 20-30 years life. 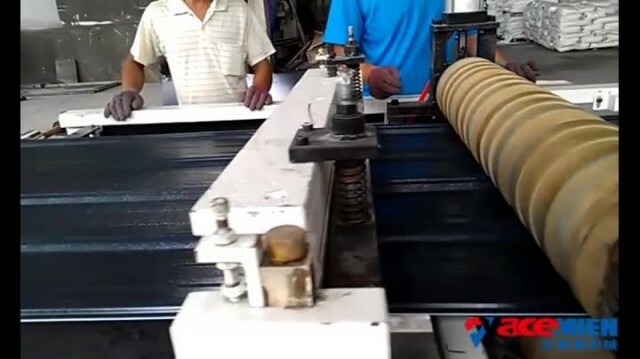 2)Corrugated tile width 920mm/1130mm,thickness 1.5-3mm adjustable. Other product width can be customized. 3)plastic Corrugated tile have the same product structure with metal sheet. 4)Trapezoid or Round shape for your choice.